"Create a pattern for movement for your job or career!" How is the Nun Karma aspect related to career? The path of enlightenment for many over the ages involved joining a group, whereby one's spiritual life could be sheltered and protected as in a Convent or Monastery. In a world where the average person could not envision a spiritual path let alone understand it, the spiritually enlightened were not always appreciated. Like the ilke of witches they could come under attack. A secluded community was the answer not only for protection, but to grow the movement. As a result they have contributed a great deal to the evolution of our religions, dogma, culture of arts and music, and no doubt more. Of course there are also many non-coherent patterns generated by living in a such a secluded community - the loss of identity, independence, individuality etc. All of these situations can be brought forward in our soul energy field as karmic plus' and minuses to be resolved in our current life. If you don't believe in or have thought about a past life connection, this could surface for you as unexplained patterns of pain or limitation - why does one family member always find financial success and another with similar effort always goes broke? Why are you always working for someone who over powers you? Why is your work never recognized? Or for all of your hard effort why are you barely getting by? Our Nun Karma repatterning is here to address these aspects and others related to these past life experiences. 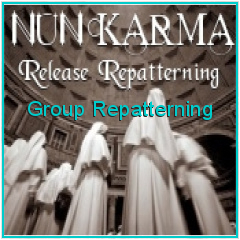 In this recorded session, we will do the Nun Karma repatterning with a special focus on Attaining our Goals and Being Successful. The repatterning contains an updated method of accessing our past life patterns that can be revisited several times after the session to keep clearing the patterns. recommend actions to take after the session that anchors the shifts and creates movement for job/career. The session is part of a hologram and can be accessed for healing shifts again and again after the live session is over. Register and the hologram will anticipate your future participation! You will literally feel a new pathway open up in your awareness receiving new insights for your career or job situation. These can arrive during the session or days and months afterwards creating awareness coherence. Sometimes the insights are mystical! Join us for this journey of job and/or career support. Register today and begin your process at anytime.